It’s Tuesday! You’re back from an exhausting work trip, and too lazy tired to stop at the grocery store on the way home. You open the fridge. The landscape is barren: slimy cilantro, moldy sour cream, suspiciously dated milk, a package of tofu. There’s hope in the freezer. Frozen salmon filets and beluga lentils in the pantry make a quick meal, but what is a home-cooked meal without vegetables, especially after several days of restaurant and hotel cuisine? Lying in the produce drawer you find some carrots and half-used fennel bulb from last week’s shopping. You remember the delicious carrots you had at Thanksgiving last year, and then: the languishing cache of smoked paprika in the spice cabinet, and those hazelnuts from last summer that may or may not be bordering on rancid. Hallelujah! A vegetable side dish fit for a Thanksgiving table is re-created on another dark winter evening while lentils cook. 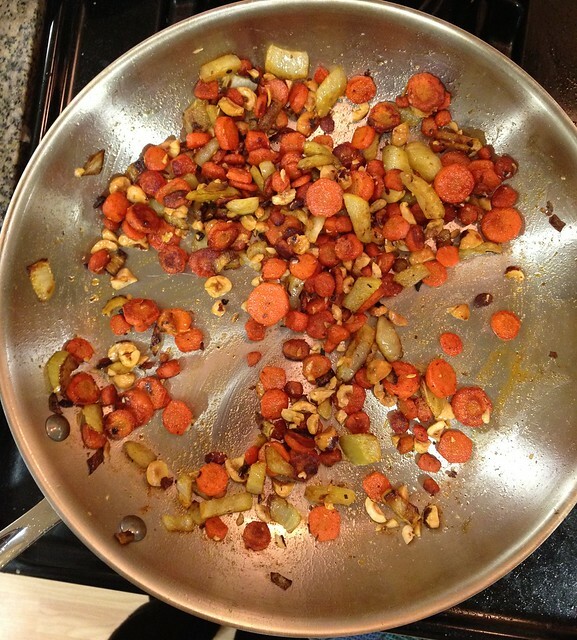 Smoky Spanish paprika adds depth to caramelized fennel and carrots. Adapted, loosely from Susie Middleton’s Fast, Fresh and Green. Heat olive oil over medium heat and add carrots and fennel. Season with salt. Cook on low until tender and caramelized, ~30 min. They should be brown and roasty, and it’s easier to do this if you don’t stir them too much at first, then stir more later. When all is cooked, add sherry and stir until evaporated. Sprinkle with paprika. Garnish with the toasted hazelnuts.